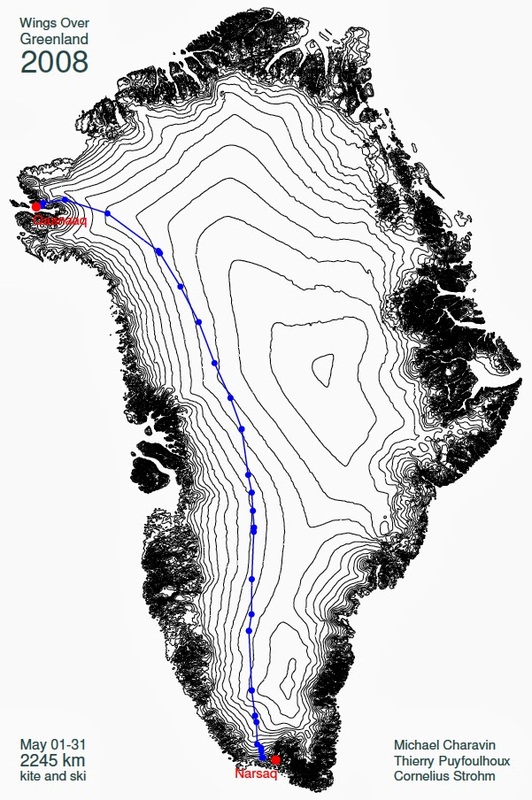 After 2 years of preparation, we sucessfully crossed the Greenland Icecap from Narsaq to Qaanaaq in a team of three: Michael Charavin, Thierry Puyfoulhoux, and Cornelius Strohm. Itinerary of Wings Over Greenland 2008. We are now back in France since some time and the expedition seems already far away. Still we only slowly realize that we actually made it. A dream has come true for us! We have crossed Greenland from south to north, 2240 km over the icecap from Qaleraligd Fjord close to Narsaq all the way up to Bowdoin Fjord and Qaanaaq. During the whole trip we only walked for 60 km - all the rest was covered using the wind with our Ozone kites and one additional skisail. Thanks to the kites we were able to cover 2215 km sea level to sea level in only 29 days and 5 h. And Narsaq to Qaanaaq in 31 days. Being lucky with our choices for the access to and the exit from the icecap, we were able to do the whole trip without further assistance, except boat transport from Narsaq to the starting point. And of course except the cup of tea offered by Lou and Mark when we met them as well as a Finnish and a German expedition at Dye 2 - it would have been a pity miss this one. We had a good time out there kiting! Thanks to all who made this possible for us! On the way to Qaleraligd Fjord. Hauliong up the gear. In the background: Qaleraligd Fjord. Heading north. Our skis: Movement Powpow and Movement Gladiator. Good going with our Beringer Skisails. are low rather than high winds. satellite phone, cameras, video camera and MP3 players. Yakuza 12 m2 on loooong lines. A majestic sight. ... on handlebars. Not everyones taste, yet I liked it. Others preferred a good wrestle with the Skisails. Break during a long day. DYE II - a relic of cold war in the middle of nowhere. Enemy missiles anywhere? Are you still protecting us ? manual, surely a good read. Midnight sun. "Deuxieme gratuit". Optical illusion. ... big sastrugi. Many of them. Actually 800 km of Sastrugi. metres on grass gravel and rock. Pulkas once on Bowdoin Fjord.